Tag line: "A new- and altogether different- screen excitement!!!" Trivia: The strings-only score by Bernard Herrmann is ranked #4 on the American Film Institute's "100 Years of Film Scores"
Psycho, Alfred Hitchcock’s 1960 thriller, has been spoiled for generations of film fans. A pity, really, when you consider it's a movie that was designed to shock you. Hitchcock knew this, and legend has it, at the film’s premiere, the great director threatened bodily harm to anyone who revealed its surprises once they left the theater. Of course, with word of mouth being what it is, the mystery didn’t remain mysterious for very long. Then, once Psycho was heralded as a classic, keeping its secrets became virtually impossible. 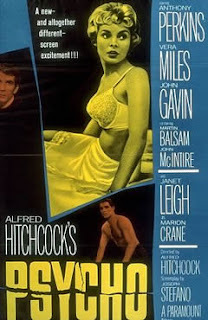 Marion Crane (Janet Leigh) works as an assistant at a Phoenix-based real estate office. When her boss gives her $40,000 in cash to deposit into the bank, Marion instead runs off with the money, hoping it’ll be enough to start a new life with her lover, Sam Loomis (John Gavin). Later that night, exhausted from hours of driving, Marion decides to spend the night at the Bates Motel, a small, out-of-the-way lodging owned and operated by the strange but friendly Norman Bates (Anthony Perkins), who, along with his mother, lives in the old house out back. Anyone who's seen Psycho knows I’m leaving a lot out. And yes, I realize it's somewhat ridiculous to try and discuss the movie without going into more detail. But seeing as over 50 years have passed since its release, it’s quite possible there are some out there who haven't seen Psycho, and I'll be damned if I'm gonna be the one to ruin it for them. But then, how do I do justice to this extraordinary film? Even those who haven't experienced it will have undoubtedly heard about its most famous scene, which involves the unsuspected murder of a main character, and based on the above synopsis, just mentioning “murder” is itself a spoiler. So, in lieu of discussing the plot any further, I offer the following observation: what Psycho does is it takes an audience right out of its “comfort zone”. At the outset, we dedicate so much of our attention to one aspect of the story that we're completely blind-sided when the movie veers off in another direction, and any observations we've made are null and void in the blink of an eye. In short, we lose our bearings, and are at Hitchcock's mercy from there on out, with no idea where he's going to lead us. What's more (and the reason it's such a disturbing work), there's ultimately no moral to the story, nothing to be learned from the ensuing chaos. In the end, all we're left with is the understanding that sometimes bad things happen, and this is a chilling reality to have to face. So, have I done this great film justice? Probably not. Some would argue I haven't even scratched the surface. But I didn't reveal much, either, and if you're among the select few who have yet to see Psycho, I'd like to think I at least did you a service by keeping it vague. And know I envy you. To experience Psycho without advance knowledge of its secrets…that’s a movie lover's dream come true! Somehow, when I watched Psycho, all I knew about was the shower scene, so it was a big shock when it all came together. Robert: Nice! That's best way to approach this film: with as little advanced knowledge of it as possible. It was the same way for me; when I first saw Psycho, all I had heard about was the shower scene. So when I got to the ending, I was stunned. If I remember correctly (it's been a long time), I stared at the screen blankly for a minute, then turned to my Mom and asked her, "Did that just happen??" She had seen the movie before, and hadn't told me anything. She thought my reaction was hilarious. Wow!! I love this challenge! I would really like to commit to watching 2500 movies, that is the coolest idea ever!! What can I do to support you?